Right now over at Amazon.com you can score this Razor E100 Red Electric Scooter for only $70.24 shipped (Retail $159.99). 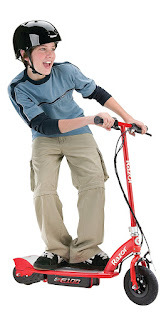 This scooter can travel up to 10 miles per hour and features a kid-sized deck and frame designed for kids ages eight and up. The zero emission electric powered engine is super quiet so you won't have to worry about your kiddos driving the neighbors crazy.